Dealing with a bed bug infestation in your home can be a huge pain in the neck for a number of reasons. One reason is that bed bugs can get all over your clothing and make the infestation even worse. For this reason, you should take any clothes that may have potentially come in contact with the infested area and clean them immediately to eliminate the threat of bed bugs spreading when you wear your clothing. Here are some tips for cleaning clothing that may have come in contact with bed bugs in your home. Sort any clothes that may have bed bugs on them and place them into sealed bags. 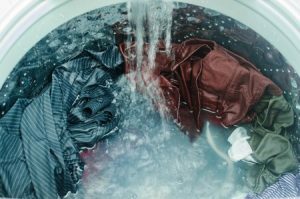 Before you take your clothes to the washing machine in your home or drive them to the laundromat, you should sort them out as you normally would and put them into heavy-duty bags that will prevent any bed bugs from getting out. You should also make sure you bring every single article of clothing that was exposed to bed bugs to be washed. All it takes is one shirt or pair of pants with bed bugs on it to keep an infestation going, so don’t leave any clothes with bed bugs on them behind. Wash your clothes on the hottest temperature possible and then dry them. Once you get to the washing machine in your home or at the laundromat, you should take the bags and tip all of your clothes into the machine. Do not touch the clothes, since bed bugs could attach themselves to you or the clothes you’re wearing and spread that way. After you have all your clothes in the machine, turn the temperature to the hottest setting and let your clothes wash. Then, remove them from the machine and place them into a dryer and dry them like normal. This will kill all of the bed bugs on your clothes. Keep your clothes away from the bed bug infestation in your home until it is under control. After you’re done washing and drying your clothes, they should be 100 percent free of bed bugs. But before you bring them back into the part of your home that had bed bugs, you should have an exterminator come in and take care of the infestation for you. It can take some time to treat a home for bed bugs, so in the meantime, you should store your clothing in a different area of your home away from where the infestation took place. Amherst Exterminators understands just how frustrating a bed bug infestation can be. So if you ever find yourself in the unfortunate position of having bed bugs in your home, we can come out and get rid of them as quickly as possible for you. We can also give you tips for treating clothes, bedding, furniture, and more to prevent a bed bug outbreak from getting worse. Call us at 716-908-2475 at the first sign of bed bugs, and we will come right out to help.